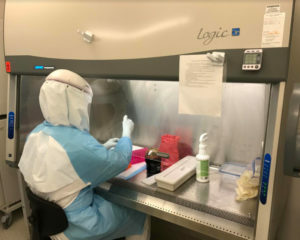 The Department of Comparative Medicine (DCM) -managed BSL3/ABSL3 facility is a state-of-the-art high containment research facility designed for both in vitro and in vivo research requiring biosafety level 3 (BSL3) containment, including work with select agents. Research conducted within the facility furthers the understanding and development of vaccines, diagnostics, and treatments for potentially life-threatening infectious diseases. The facility is available for use by UW investigators as well as external institutions. Contact Rick Wells (206.616.7432) for additional information. Learn More about facility management and operations. Click here regarding services available to BSL3/ABSL3 facility users. Find out more about facility design and management at BSL-3.